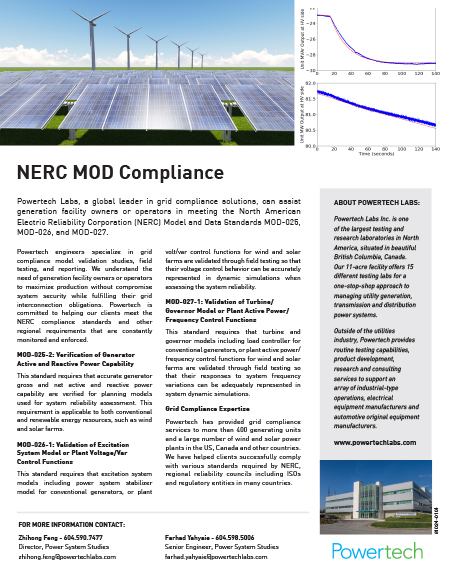 Powertech Labs, a global leader in grid compliance solutions, can assist generation facility owners or operators in meeting the North American Electric Reliability Corporation (NERC) Model and Data Standards MOD-025, MOD-026, and MOD-027. Powertech engineers specialize in grid compliance model validation studies, field testing, and reporting. We understand the need of generation facility owners or operators to maximize production without compromise system security while fulfilling their grid interconnection obligations. Powertech is committed to helping our clients meet the NERC compliance standards and other regional requirements that are constantly monitored and enforced. This standard requires that accurate generator gross and net active and reactive power capability are verified for planning models used for system reliability assessment. This requirement is applicable to both conventional and renewable energy resources, such as wind and solar farms. This standard requires that excitation system models including power system stabilizer model for conventional generators, or plant volt/var control functions for wind and solar farms are validated through field testing so that their voltage control behavior can be accurately represented in dynamic simulations when assessing the system reliability. This standard requires that turbine and governor models including load controller for conventional generators, or plant active power/frequency control functions for wind and solar farms are validated through field testing so that their responses to system frequency variations can be adequately represented in system dynamic simulations. Powertech has provided grid compliance services to more than 400 generating units and a large number of wind and solar power plants in the US, Canada and other countries. We have helped clients successfully comply with various standards required by NERC, regional reliability councils including ISOs and regulatory entities in many countries.